Dr. Danny Lee is the first surgeon in Alabama to perform the KAMRA inlay to improve reading vision. In fact, Dr. Lee is one of the first ophthalmologists in the country to offer the new technology to correct presbyopia. It is estimated that more than a million people in the United States are struggling with the frustrating, natural eye condition known as presbyopia. 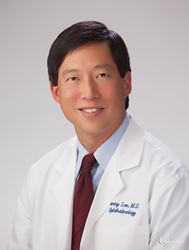 Now the procedure is performed at the Laser Eye Center in Huntsville, Alabama by Dr. Lee. As people reach their 40s or 50s and find themselves reaching for reading glasses more and more often, this new procedure may be the solution. As a person ages, so do the lenses in their eyes and they begin to experience the effects of blurry close-up vision. Activities such as reading, surfing the web, or working a crossword puzzle become a struggle, putting a strain on the eyes. Presbyopia continues to progress over time. Someone who is in their 40s may only notice it when trying to read tiny print in low light. However, over time, they will probably depend on reading glasses more often. The KAMRA inlay treatment is a procedure that restores near vision resulting in freedom from reading glasses and visual strain. The KAMRA inlay sits in the first few layers of the eye known as the cornea. Smaller and thinner than a contact lens, the inlay is a mini-ring with an opening in the center. By using the pinhole effect, the inlay focuses light coming into your eye. This restores near vision while maintaining distance vision without blurry zones. A quick quiz at the Online Suitability Check can tell someone who thinks they're suffering from the symptoms of Presbyopia if KAMRA Inlay is right for them. Please visit http://www.dleemd.com for more information on presbyopia and the KAMRA inlay or to make an appointment with Dr. Danny Lee.